Brad was great through the entire process. He help sell our home and purchase a new one. He was amazing with helping with our needs and request. He's was amazing with helping with our needs and request. He's great person and honest about homes, prices, locations and anything you can think of. He's an amazing realtor and will highly recommend. are his top priorities. Brad is the only real estate professional I would ever consider for any future real estate transactions. Brad is the BEST! Attention to detail, available all the time, prompt service! Got our rental within a week. Good folks to work with! Found the rental that met all of our criteria. Brad went above and beyond in helping us find our new home! He listened to our needs, provided helpful suggestions and input and was quick and thorough in his communication. 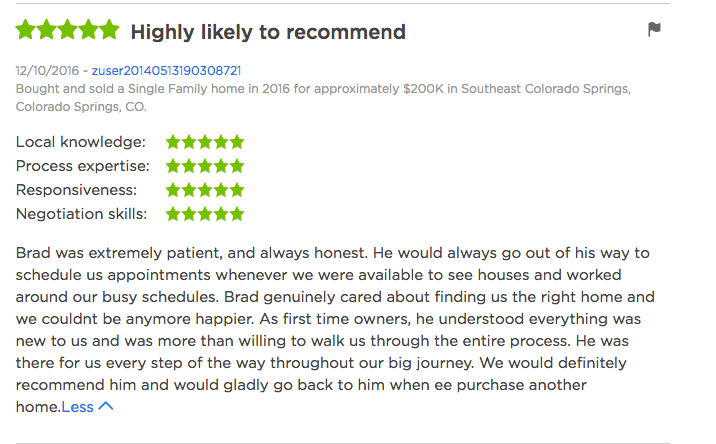 We are so happy with our new home and will definitely be recommending Brad to friends! We are so so impressed and thankful for Brad. He was on top of it every step of the way and was extremely responsive to our calls and emails. He made us feel like we were the only clients he had. As first time home buyers, we were overwhelmed with information and decisions, but Brad explained everything to us very clearly and helped us make informed decisions. Very professional and friendly- highly recommend!! Sold a Condo home in 2014 for approximately $125K in Southwest Colorado Springs, Colorado Springs, CO.
Brad and his team (including any and all people they recommended) went above and beyond any expectations we could have ever had!! We purchased our home from out of state, and the site was completely unseen by us, with that being said, Brad went out of his way to make this the most pleasant experience for us. We felt as if we had seen every nook and cranny of the home from over 4000 miles away! This was a completely stress free process for us as first time home buyers, and most of all it was fun! I would recommend Brad to everyone!!!! We couldn't be more happy with both our amazing home and the entire buying experience! 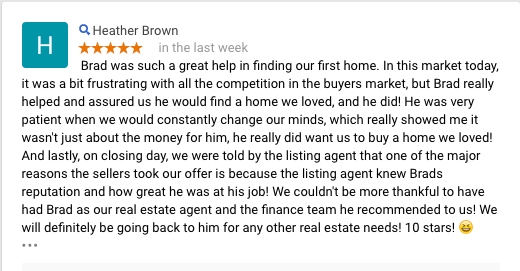 Brad is an AMAZING realtor and due to his lightning FAST response to his client's needs...I was able to get an incredible home at an incredible price! His stellar negotiating skills were absolutely necessary in my transaction and his guidance was PRICELESS! Brad is not only highly skilled in the real estate transaction but he was also able to teach me how to buy my home with ZERO $$$ out of my pocket!! I would HIGHLY recommend him to anyone buying a home---and I am so very happy that I found him! 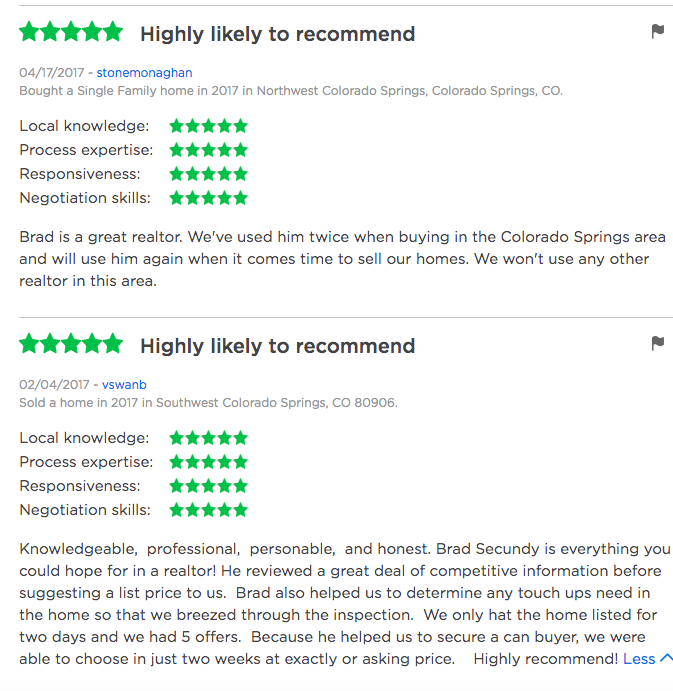 Bought a Single Family home in 2014 for approximately $250K in Southwest Colorado Springs, Colorado Springs, CO.
Brad Secundy is an all-around nice guy as well as a professional. He negotiated an amazing deal when we bought our house. We are not so great at the paperwork end of things and he handled all of that adroitly. The process was handled easily and quickly. When we were shopping for a real estate agent, he even outbid relatives that were real estate agents. I would not hesitate to recommend Brad Secundy to anyone wishing to buy or sell real estate. 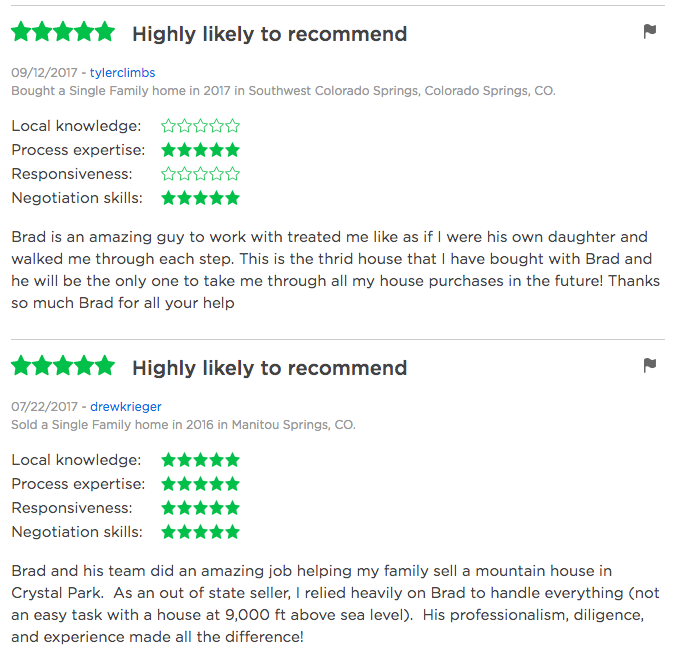 Bought a Single Family home in 2014 for approximately $150K in Southeast Colorado Springs, Colorado Springs, CO.
Brad was extremely helpful and made sure to answer all of our questions in full. 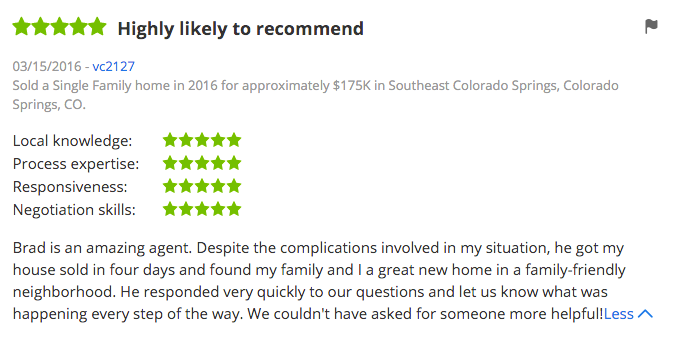 During our home buying process my wife had to have surgery and some things got put on hold, but Brad was very patient and insured that we had all the time we needed to make a sound and informed decision. When we were in the final stages of the closing process i had a 2 week field exercise and was unable to receive regular communication. Thanks to Brad everything went through as planned and he kept me well informed of what was going on. 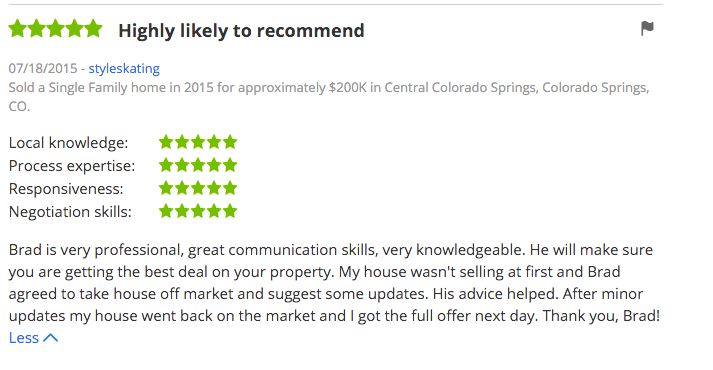 I would highly recommend Brad for any first time home buyer that wants an honest and trustworthy real estate agent. 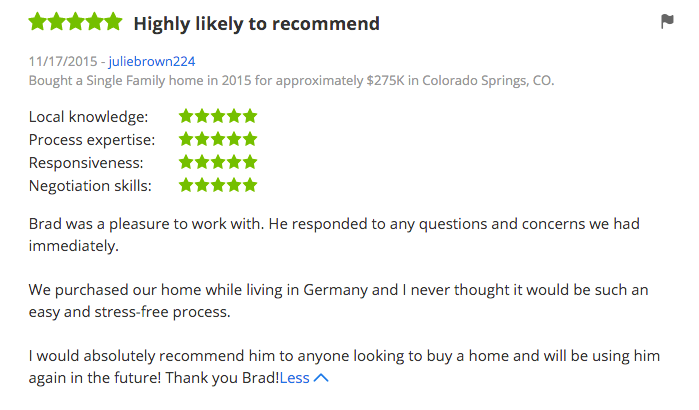 Bought a Single Family home in 2014 for approximately $350K in Monument, CO.
Brad helped us find a great home. He is very professional and responsive. He does an excellent job of listening to the customer's needs. He did a great job handling the negotiation process. Brad was always available to handle the purchase. He makes you feel like you are his most important client. I definitely plan to use him again on a future transaction. Sold a Single Family home in 2014 for approximately $175K in Colorado Springs, CO. I, truly,cannot say enough about Mr. Secundy. We had our house on the market 4 days... And, already had an offer. Our house sold very quickly. I believe this was because of his dedication. He has a very straight-forward way of speaking. And, he completely supported us. My calls, texts, and emails were always returned, immediately. Regardless of whether it was late, or a weekend. Mr. Secundy was great about explaining all the jargon. And, he never "talked down" to us. Working with him was a wonderful experience. I will not hesitate to work with him, again. And, I will continue to recommend him to my friends and family. Selling a house is very stressful. It was nice to have a broker that took most of the stress out of it. I highly recommend him. He is a great guy! Bought a Single Family home in 2014 for approximately $225K in Northeast Colorado Springs, Colorado Springs, CO.
We came to Colorado Springs on very short notice for a holiday weekend. Brad dedicated the entire weekend to showing us houses and helping us find a rental property that met our needs. He made it easy and became and instant friend. 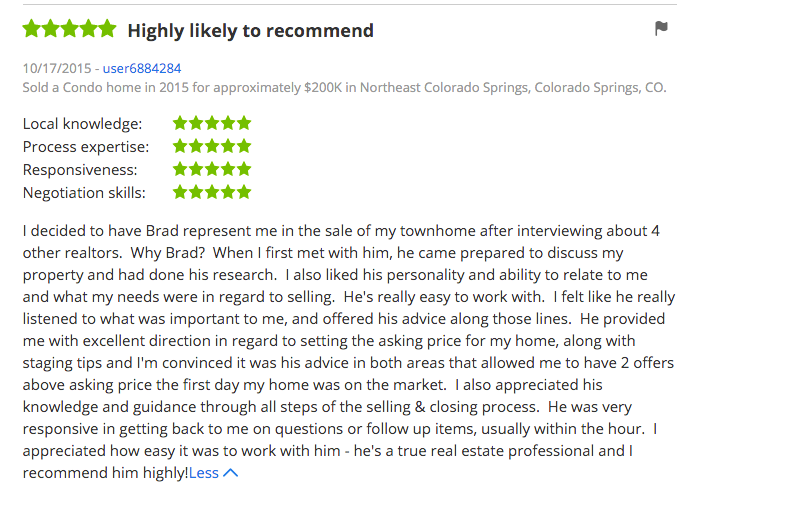 Brad was very dedicated and very helpful in helping us buy our first home. We lived 3 hours away which I thought made the process a little more difficult but brad really got out there to do what ever he needed to do to view a listing and get the pictures or videos back to us a.s.a.p.. Very great honest person to work with. We most likely would have brad help sale our house once we relocate. 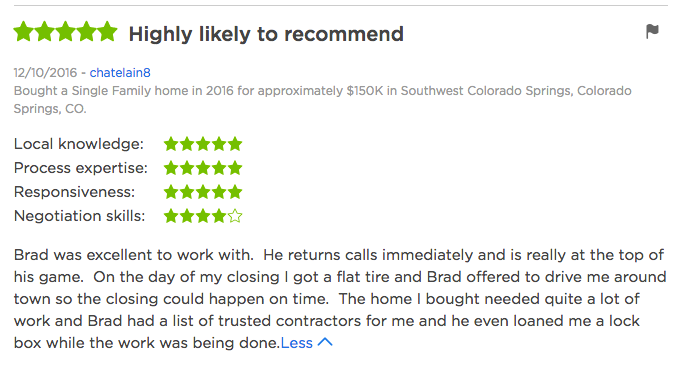 Bought a Single Family home in 2014 for approximately $175K in Southwest Colorado Springs, Colorado Springs, CO.
Brad was with me every step of the way. I am young and have not had experiance buying a house before and he made it so easy and helpped me find a great house. Brad is for sure the man to use and he also turned into one of my good friends. Friends don't let friends buy bad house. I love my realitor! Brad was instrumental in guiding us through the whole purchasing project. He zeroed into what we were looking for and showed us all these great options. At no point we were rushed or pressured, making the selection process enjoyable. His negotiating skills allowed us to buy our dream house and at a great price. 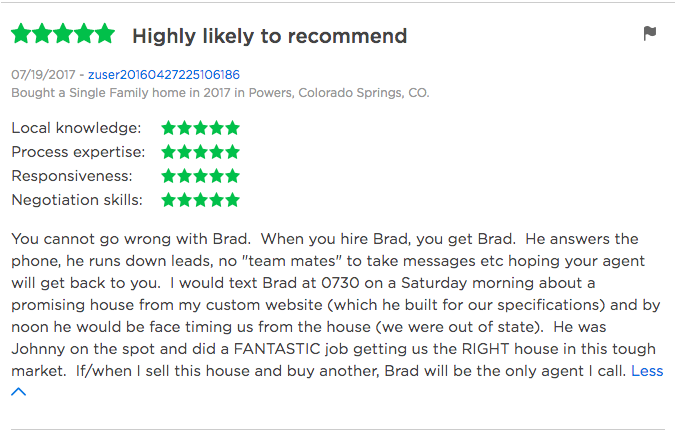 It is with no reserve that I recommend Brad for any real state needs you might have. He will always be the first phone call we make when it comes to our real estate needs. Brad is an excellent representative for the local market. This was our second time working with him on our home purchase. It is unfortunate that we moved from the area and not able utilize him in the purchase of our next home. He is honest, trust worthy, and made the sale of our home a seemless transition. 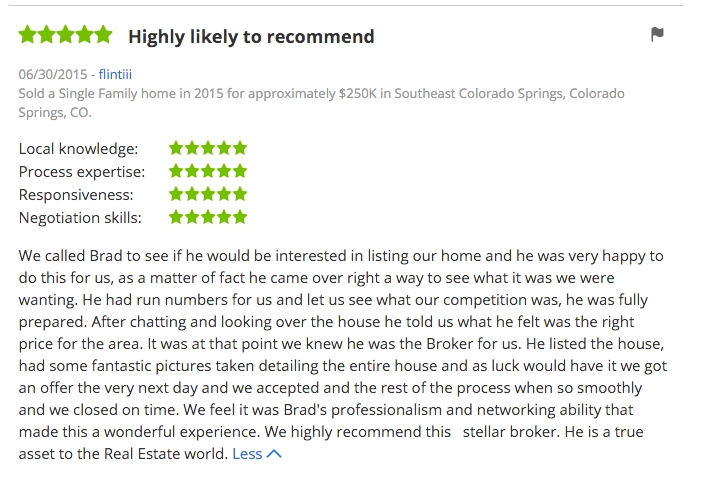 We would highly recommend Brad to anyone purchasing or selling a home. Brad is great to work with. We used him to buy and sell our house and he actually made the experience fun. We sold our house the first day of showings, which we were thrilled about. I highly recommend Brad and will use him again if we move back to the area. Everything about Brad was great. He gave us the time necessary and was in constant contact with us during the process. We understood the timelines and the process and felt very comfortable with him as our Realtor. Brad helped me through the entire process from negotiating a bid, ensuring all steps were completing prior to the closing process and then followed through to the closing and post closing support. He's been great and I owe him a HUGE thanks for making this process so smooth and easy!!! We've worked with Brad Secundy on three property transactions. He is very prompt with communications and open to our concerns. We never feel pressured to make any decision. He is very knowledgable of the real estate business and has provided unbiased professional information for us to make right decisions. He is the realtor we trust and would continue working with in the future. I have worked with Brad now on two purchases and one sale. He is focused on your needs and makes sure each property you consider is the right one based on those. During my recent purchase of a townhouse, Brad worked through getting difficult issues with the seller resolved quickly and fairly while still maintaining my origional closing date. I would recomend Brad Secundy to anyone looking to buy or sell real estate in the Colorado Springs area. He is simply the best out there. My husband and I were very familiar with the area and knew what we were looking for, but we needed a realtor to help get us in to see potential properties as soon as they came on the market and then to facilitate the entire process. Brad was very accessible and went out of his way to make sure he got us into homes extremely quickly for showings. When we wanted to put an offer in on a home, we knew the owner would receive multiple offers. Brad gave us great advice to win our new home over other multiple offers. Thanks, Brad! Showed home in 2013 in Green Settlement, CO 80906. 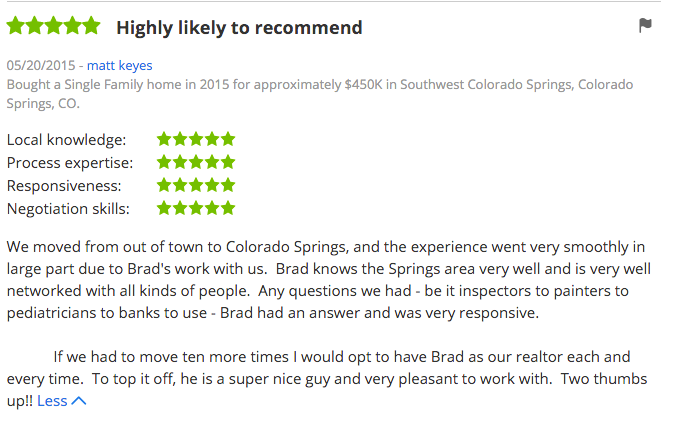 Out of all the agents we have worked with over the years Brad is the best. He helped us find the perfect home with everything we were looking for. He always emailed and called us back, and was very quick at getting the answers we asked. We have been looking for our dream place in Colorado Springs for awhile and Brad has been helping us throughout the process. He is thorough and thoughtful, always looking for new places which fit the bill. Brad is always timely and on time for site visits; clean, tidy and organized! He gives you great comfort that he knows the process and keeps the process moving with an eye of getting the job done! 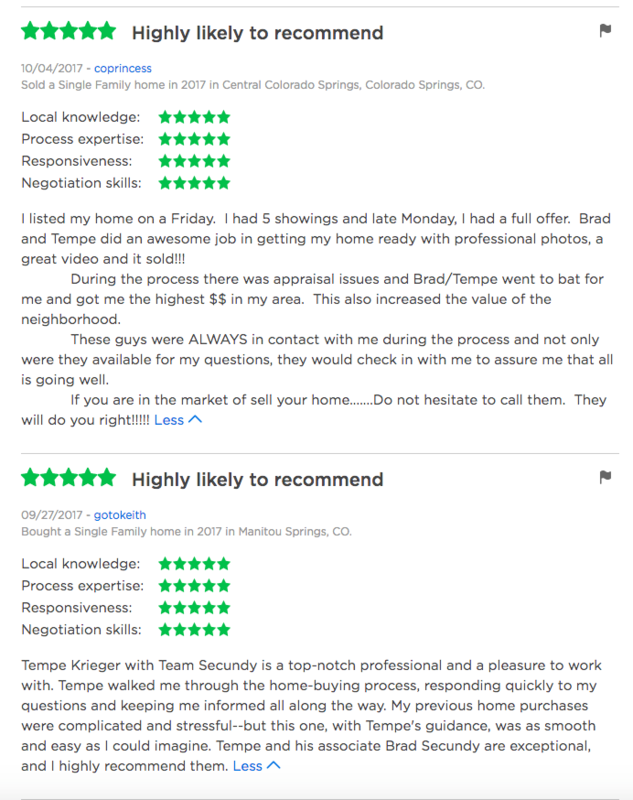 Bought a Single Family home in 2013 in Southeast Colorado Springs, Colorado Springs, CO.
Brad Secundy and his team were very Professional and very accessible. Brad has great knowledge about the area . We bought investment property in the past couple of years and certainly glad we did since now home prices are soaring . All the contacts provided by him (including the financing) were really helpful and good. It was a pleasure to work with such a hardworking, dedicated, aggressive real estate agent. 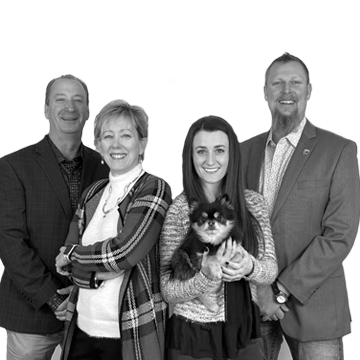 Bought a Single Family home in 2013 in Southwest Colorado Springs, Colorado Springs, CO.
We are so happy in our home in Colorado Springs and we want to say how totally wonderful it was to work with Brad Secundy who made it happen. He knew the market, made excellent suggestions and his team guided me through the whole process. finding us a great lender Gary Schorg who got the loan done. Our situation was particularly difficult as we needed to get our home sold and needed to be in District 12. Brad diligently sought opportunities, researched all prospects and was available anytime we needed to talk and act. We would use him again in a heartbeat and we have already recommended him to friends and colleagues. My husband and I would highly recommend Brad Secundy as the perfect real estate agent for anyone buying a home. He truly listens to your requests, concerns and must haves and will show you properties that fit your requirements. He is a very friendly and warm person as well as extremely professional and knowledgeable in his field. We had allot of must haves. District 12, $600-$650,000, Nice patio, Garden, Open floor Plan, Finished basement, theatre room etc.. But he found it for us..We do believe that we found our perfect home solely because of Brad's expertise! He knows the area, the school districts etc..We are sure your experience with Brad Secundy & his team will prove to be a successful and pleasant one! Showed home in 2011 in Colorado Springs, CO.
Brad is an excellent real estate associate. He showed me many homes in the Colorado Springs area. His dedication to his clients is unfailing and total. The market knowledge he possesses is extensive. Brad was patient and it was a pleasure working with him. He showed me homes in my price range and was extremely easy to work with. 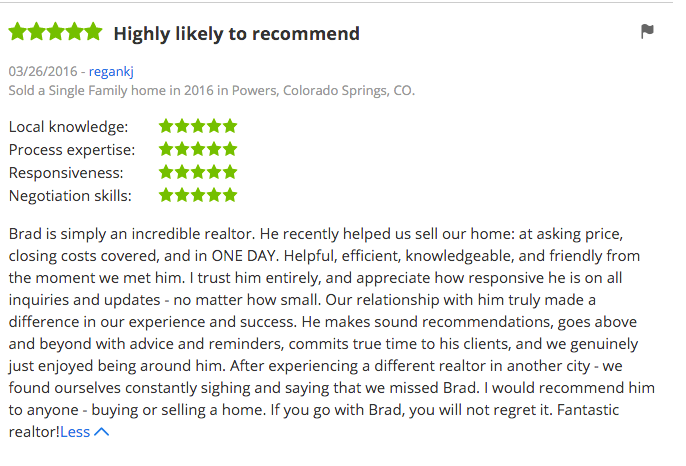 I would recommend Brad to anyone looking to buy or sell a home in Colorado Springs. Bought a Single Family home in 2005 in Southwest Colorado Springs, Colorado Springs, CO.
Brad Secundy is the ultimate professional but it feels like you are working with a good friend. As a home buyer of a lower priced house I was amazed at how dedicated and eager Brad was to find the perfect home for me. He worked tirelessly to help me through the entire process, even communicating with me during his vacation outside the US!! I am very lucky to have hooked up with him and am very appreciative of how hard he worked and how great buying a house with his assistance was. Even his recommendations of other professionals to work with for a mortgage or inspection were spot on! 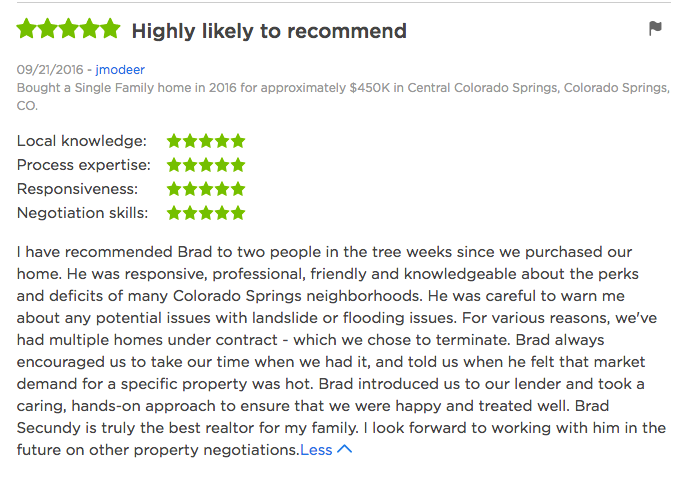 I highly recommend Brad as your number one choice to work with! You surely won't be disappointed! Whether you are a buyer or a seller, it's guaranteed to be a sucessful experience for you in every way! Thanks, Brad! You're the best!